Nick with Elimin'ator 134 after the flight. 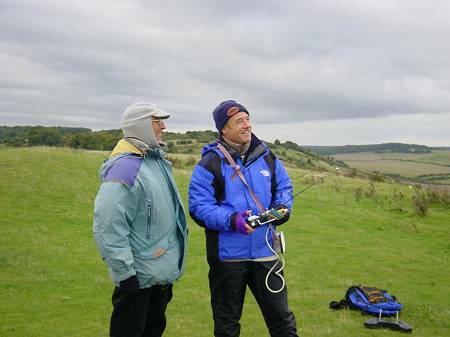 Congratulations to Nick Shaw for breaking the World Record for F3 Glider Duration, at Ivinghoe Beacon, England. Nick's model was launched at approximately 6.30 am on Friday 8th September 2001. It landed soon after 18.30 on Saturday, a few metres from the launch point. The flight duration of 36h 3mn 19s has been ratified as a new World Record. The old record of 33h 32mn 30s has stood for 18 years. 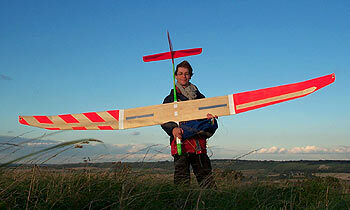 Nick flew his "Odyssey", a modified Eliminator 134 which was fully rebuilt after his unsuccessful attempt in July. The wind for most of the flight was 15 - 25 mph, from between West and North. However shortly after dawn it dropped to 8 mph. The weather was a mixture of sunshine and showers, with a period of rain shortly before dawn. When I joined the party 18 hours into the flight, at around 1.15 am, t he model was clearly visible in the dark, its green electro-luminescent strips on the wing glowing nicely, along with the high power red LED's on the tips and tail. In fact it attracted the attention of the local Constabulary who turned up in the early hours. Perhaps a UFO sighting?! Even at 1.30 am there was considerable activity with helpers and officials keeping things ticking along. The regulations allow for 10% rest breaks and at this point Nick handed over to co-pilot Martin Christmas. Martin himself did very well to fly the model after being awake for 22 hours. Meanwhile Nick took a couple of hours rest before resuming the controls. Gradually the helpers retreated to the tents for some rest, and Nick got down to flying with two spotters to help keep an eye on the model. A major drama unfolded 23 hours into the flight, at 5.15 am. All town and street lights disappeared, all we could see in the moonlight was horrid black clag heading straight for the hill. Rain was on the way! The wind also decided to strengthen and shift to the North, further complicating matters. Nick and spotters retreated behind the wind-break where we were protected from the worst effects of the rain. A few minutes later, still in almost pitch darkness, the model's lights disappeared completely as the model went into mist and low cloud. Visual contact was lost for about five, very long seconds before the model reappeared. Nick very coolly picked up control, and for the next 30 minutes flew the model actively in a figure of eight pattern below cloudbase, slightly out of the main lift area. The horrible conditions presented a real threat to the flight and it was a considerable achievement on Nick's part to get through this phase of the flight, particularly after only for 2 hours of rest. 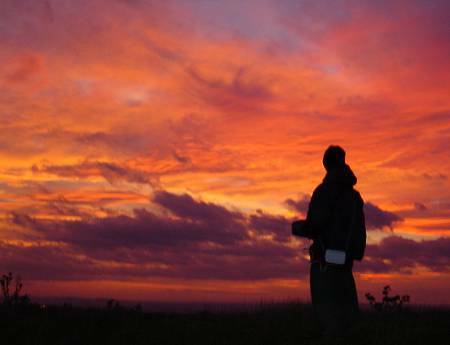 It was with great relief that the darkeness and rain gave way to a beautiful dawn. Makeshift wind break was a god-send. Relief written on Nick's face as he drinks some tea. Shaw Senior provided tea and bacon for breakfast. After the all-night action, I took some rest and returned later the following afternoon. Nick of course didn't have this luxury and continued flying through the morning and into the afternoon. Martin Christmas again did a good backup job, taking the controls from 9.10am until 9.39am. The old record fell soon after 16.00, at which point champagne and food mysteriously appeared, in glorious sunshine! Nick carried on flying until 18.30, ending with a perfect landing at the top of the Beacon to great applause. The flight represents a magnificent achievement, involving some really challenging night flying, and of course sheer endurance. A World Record will be richly deserved, and a vindication of Nick's single-minded approach to the project. The time of 36 hours, 3 minutes and 19 seconds is to be put forward for ratification by CIAM as a new World Record for F3 Duration. Nick chatting to Jim Chambers. Odyssey parked high in the lift. Martin Christmas co-piloted during Nick's rest periods. Nick's wife Michèle helped make it a party atmosphere. Discussing landing options with John Hacker and Simon Atkinson. The model is a modified Eliminator 134 from the John Stevens kit. The main structural modification was to widen the fuselage to accept the large batteries. A Futaba Challenger Tx was used, powered by seven D-size NiCd cells carried externally. The battery pack could be hot-swapped in flight. During changeover, the internal pack switched in automatically. Sandwich box contains 7 x D-size NiCd cells. Junction box automatically switches between ext/int packs. Light fantastic: electro luminescent strips top and bottom of wing. Light strips run on 3 x 9V. Two LiMnO2 13 Ah cells power Rx, servos and wing tip LEDs.